The Easy Way To Paint Curvy Furniture is sponsored by Zibra. All opinions of their amazing brushes are 100% my own. 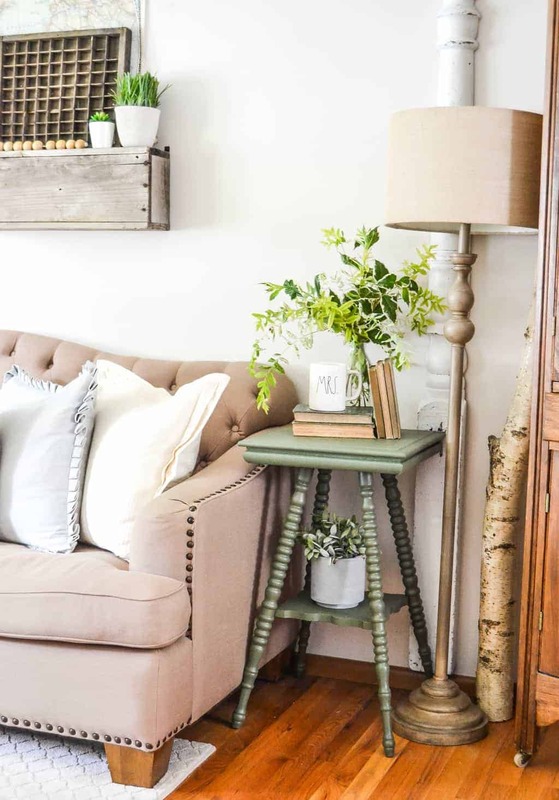 I am going to start this Easy Way To Paint Curvy Furniture post with the makeover and then if you hold on until the end, I have an amazing giveaway for you that will change all your painting projects for the better. You won’t want to miss it. This project came from a “presale” of an estate sale in May. The lady having the sale was the same lady that had the barn full of stuff we picked in early spring. She was cleaning out both her parents’ estates and was trying to get rid of as much as she could. The estate sale was at her mom’s house. Even though it wasn’t as fun as the barn pick, we still found a few things to bring home. The top had a lot of damage, but I thought I could sand them out. Affiliate links are used in this post. You can read my disclosure HERE. Before I tried Zibra Paint Brushes, I never looked forward to painting furniture pieces like this. The curves on the legs of tables like these aren’t easy to paint. I would usually end up swiping my paint brush back and forth and finding paint splatters weeks later around where I painted. It just wasn’t efficient. Then, I was introduced to Zibra Paint Brushes and my dreaded painting projects are not dreaded anymore. 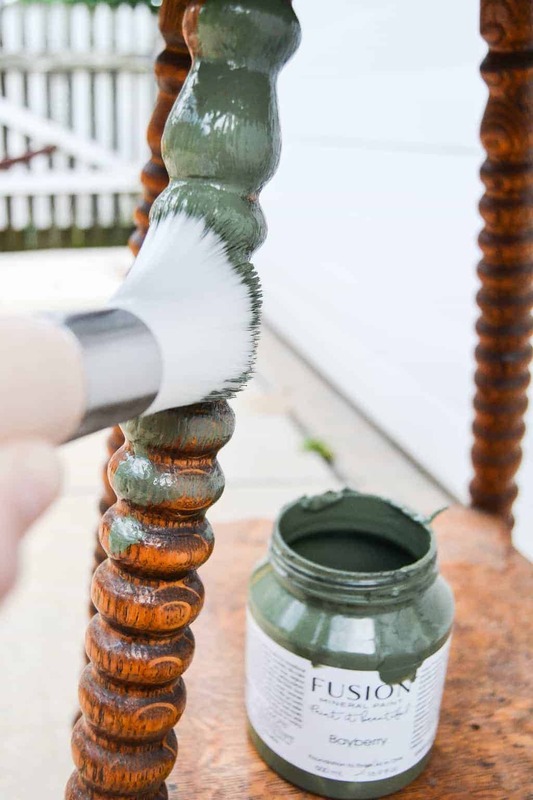 The round brush is made to paint curvy furniture pieces easier and it delivers. I shared a video on my Instagram stories of the painting process of this table. The brush went right inside the curves and the paint is covered all the crevices. Not only am I excited to share this paint brush with you, but I am also excited to introduce you another beautiful paint color from Fusion Mineral Paint. This, my friends, is “BayBerry”. I love green, but sometimes it is hard to find the right green. 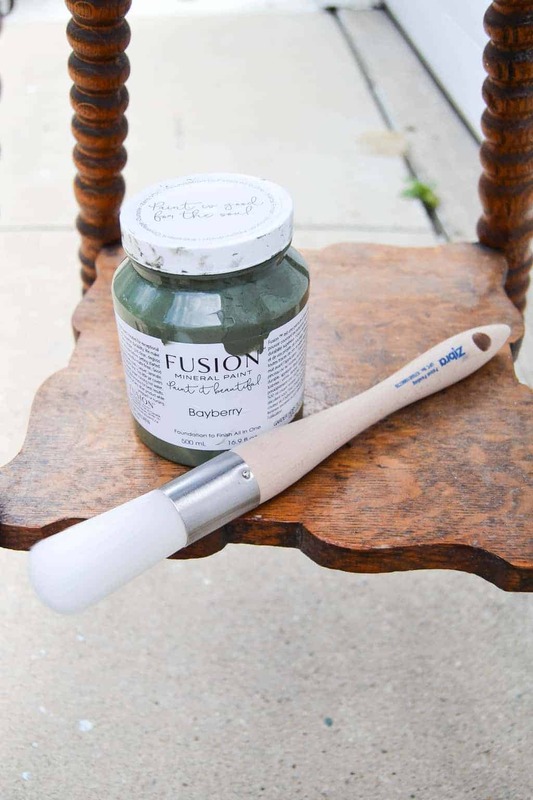 “Bayberry” and “Park Bench” from Fusion Mineral Paint are amazing green colors. I painted my office desk in “Park Bench” and I used “BayBerry” on a smaller piece and loved it. Like I said earlier, I was going to try and save the table top by sanding, but after lots of sanding, the marks were still on it. I painted the top and was so glad the sanding didn’t work because I liked it painted all over. I set the table next to our sofa in the living room. I can’t decide between the natural wood table I had there or this one. I get a lot of questions about the pieces I make over. Everyone wants to know if I keep them all. We do not have a lot of space to keep things which is a blessing for me because my OCD issues with having everything in order is easy to control. That also means that I am constantly rotating pieces in and out of our home. I pick up pieces that I love. It doesn’t matter if I have space for them or not. If I see potential in a piece, it comes home with me. Once I makeover a piece, I bring it in the house. I stage it if I am sharing it on the blog and sometimes I like them better than what we currently have. When that happens, I sell the piece we already had. We have a HUGE yard sale in the spring and summer to keep pieces cycling through. These sales have become like little flea markets. 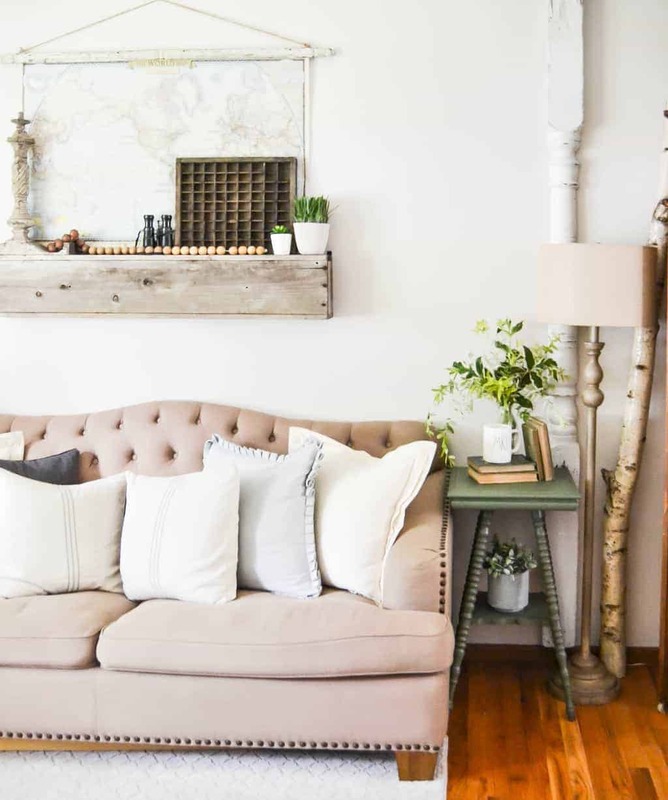 I have an email list of people who want to come to the early preview sale and we have met some of the most amazing people who totally get us and the home decor we love. They get to shop great treasures that no longer fit in our home and I get to purge and keep our home in “non-hoarding” status. It is a win-win all around! So, that is the longer answer. That is how I work all of these projects. It is so much fun for me and I am so thankful that Matt loves it as much as I do. For this The Easy Way To Paint Curvy Furniture project, it kicked the previous table out of this spot, but the jury is still out. I put the other side table next to our bed for the time being. « How To Paint A Bathtub Easily & Inexpensively! I am most excited to try the Triangle Brushes. 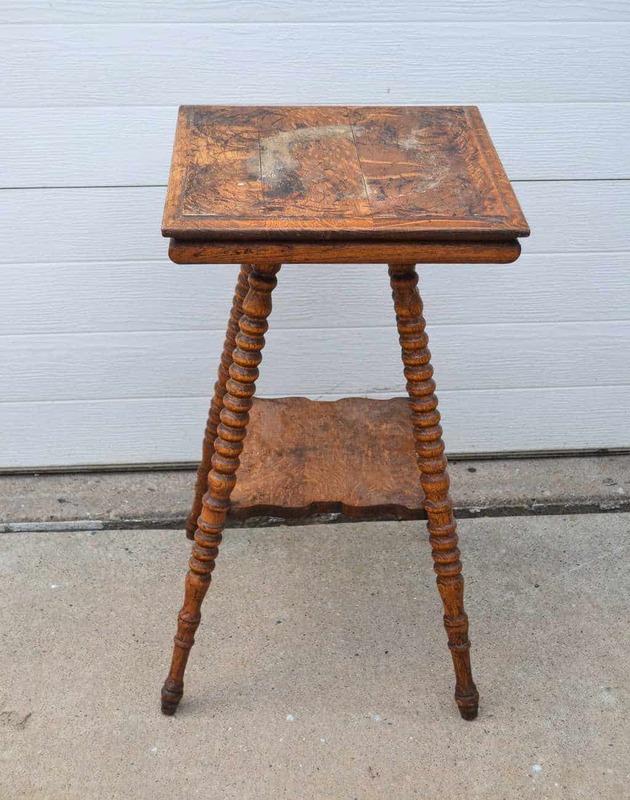 I am wanting to paint and antique side table my grandmother had! I love the table and the color. Your right it is hard to find the “right” color of green sometimes and that is the right color in my opinion. Would love to try out the round brush! I have a lot of trim to paint around here and an old rocker with lots of spindles that I’ve been putting off because I hate painting spindles. I would love to try the Zibra PB125LZT Grip-n-Glide 1-1/4-Inch Triangle Paint Brush by Zibra. We have my husbands grandmothers old rocking chair in our basement that I would love to paint and move upstairs. We have put off doing it because we know that painting all the rounded spindles on the back of it are going to be very time consuming. These would probably make it a much easier task. Your table came out so darn cute and I just love the color . I also love how the brushes look and only hope to win , thanks for the chance . I would love the palm pro brushes, I think they would work great for me. I have 2 tables I have been planning on painting, I really need to get started on them. These brushes would be a great help. The triangle brush intrigues me! I have a bookshelf I’d like to paint and a set of lockers! The round brush looks perfect for what I am needing a new brush for. 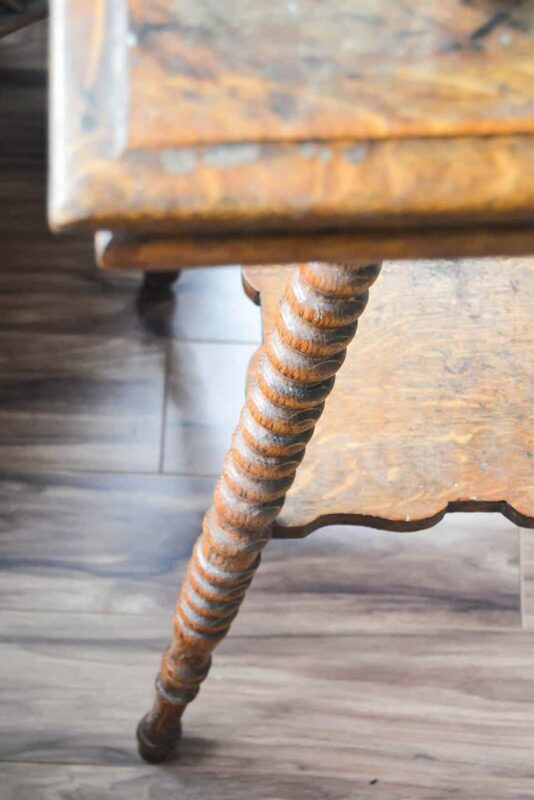 I have a French provincial dining room set that I have been thinking about chalk painting in AS Old Ochre and the round brush would solve all the problems on the curvy legs of the table and the 6 chairs! Thanks for all of your wonderful suggestions and ideas on your blog! You are an inspiration! I most like the Grip n Glode triangle brush! Would be great for corners and crevices! I want to re-paint my mailbox and also the kitchen! You did a wonderful job on the table, I can’t believe the before and after is the same piece of furniture! Wow! I’m most excited to try the detail brushes! They would make getting into the cracks and crevices easy and make it look so much better! Hi! I have a table just like this one!!! Do you know how old it is or anything about the syle? I am so glad to hear about the Zibra Brushes as I have a maple kitchen set (table and chairs with lots of curvey bits) that needs to be painted. Thanks for having this givaway! I am most interested in the no-tape edge and roll. We want to paint the baseboards in our home. Great paint color. I have a table almost like that I painted a dark grey. I didn’t have the round brush at the time but have since bought it and am looking forward to using it on my next piece I paint. Zibra paint brushes are the best. Love the table, that color is to die for . I am most excited about the round brush. 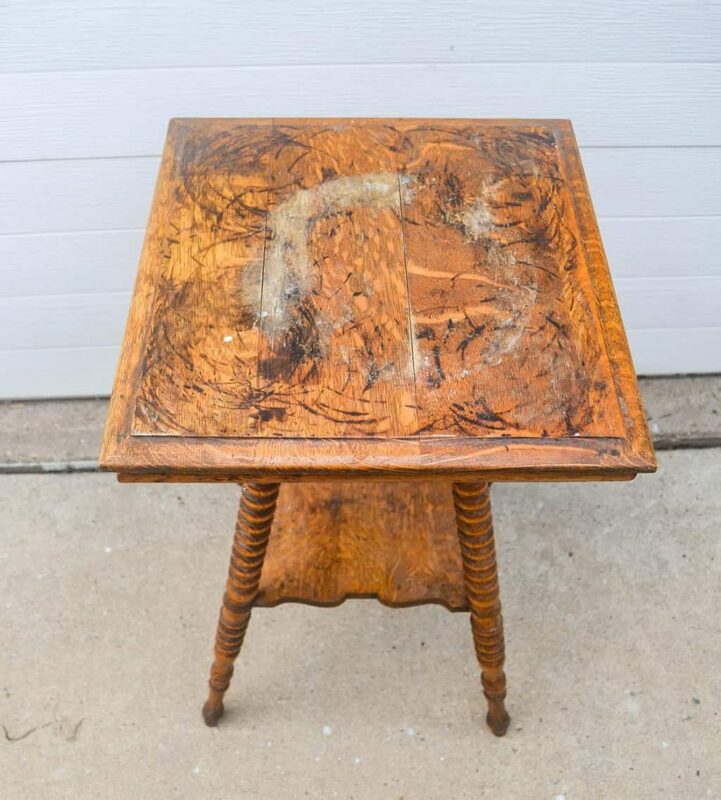 I have a table that my Grandmother gave me a long time ago and it looks almost just like this one ( even has the round swirly legs). 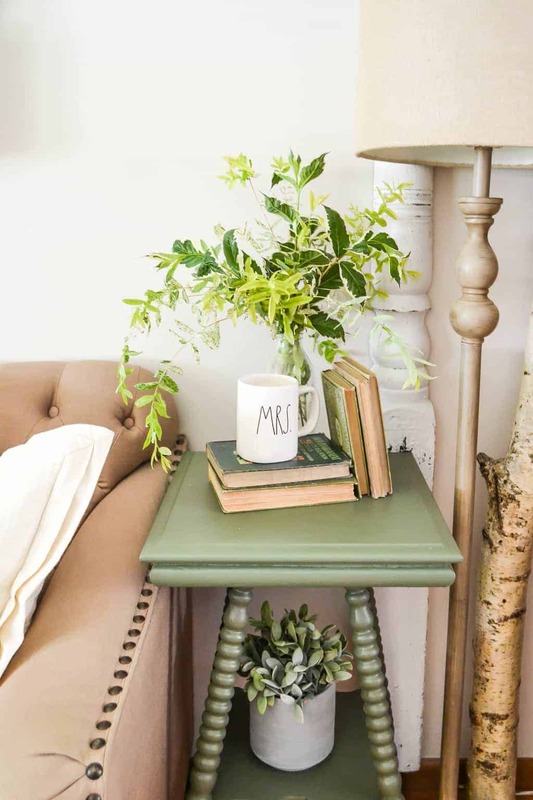 I love the color green and now I am so excited that I might be able to paint it in my favorite color and actually use it in my home without fear of making a mess of it. Thanks for the giveaway. Ok Lindsay, so I’m hopeful about winning thhe Zibra giveaway! I love the roubd brush and it’s the only one by Zibra that I actually own. I use mine tine apoky clear wax. And you nailed it with this cutie of a side table…green (my favorite color) and all! Libdsay sorry for the typos! Beautiful paint job and color. I have a few pieces I’m anxious to paint a similar color. I would love to try the triangle brush. We are working on redoing our kitchen an these would help with the corners for sure. I have a table exactly like the one you are showing…it is currently the original wood finish but after seeing this, it is going to change …I love what you have done (including your choice of color)….must get a round brush…will send you a pic of finished product…Thank you for sharing your wonderful talent!! I would like to use the triangle brush on a beautiful Jacobsen dining table. I would love to try the round brush! i have some spindles to paint and this would be perfect! I would love to try these brushes as I have never tried them before. Also I’m not normally a fan of green but that is a fantastic color! I will be using it on something soon. My question is what did you do different on the legs versus the top of the table? Thank you so much for having a giveaway! I haven’t tried any of these brushes so am excited to experience the results you mentioned for myself. Love the green but I am wondering why the legs look different than the top color? Hopefully this brush set will arrive before I start to paint my French Provincial bedroom set with more that one very detailed mirror and picture frame! Love the color of the table, looks fantastic! I so need the brushes as I have a very similar table that I’m refinishing right now. Recently I painted a table with curvy legs and you are so right about the problems with getting the paint on right. I also have an antique bed with lots of curvy spindles that’s been waiting for a makeover so I’m hoping those brushes would be a godsend. Thanks so much for the info! I would love to try the round brush on a table that I’ve had for quite a while that’s waiting for a makeover. I have several painting projects coming up and these would be a god-send!! Thank you! Thanks for the tips, nice results. Love that color of green! I am curious to try them all! I recently started painting furniture as well and the brushes I have are not working well. I keep picking brush hairs out of the painted area and having to smooth the section out. Twice the work! Beautiful table! These brushes sound awesome! I would like to try their No Tape Edge-N-Roll. This would make painting my bedroom much easier if I didn’t have to tape. Thank you for this post and for the give-a-way. I would love the Palm Pro and I can’t draw a straight line to save my life and I do horrible with tape. I just bought a table almost just like yours! I would love to try this paint brush to paint my table. Love the little green table by your couch!!! Such a pretty color… Would love to win the paint brushes!!! 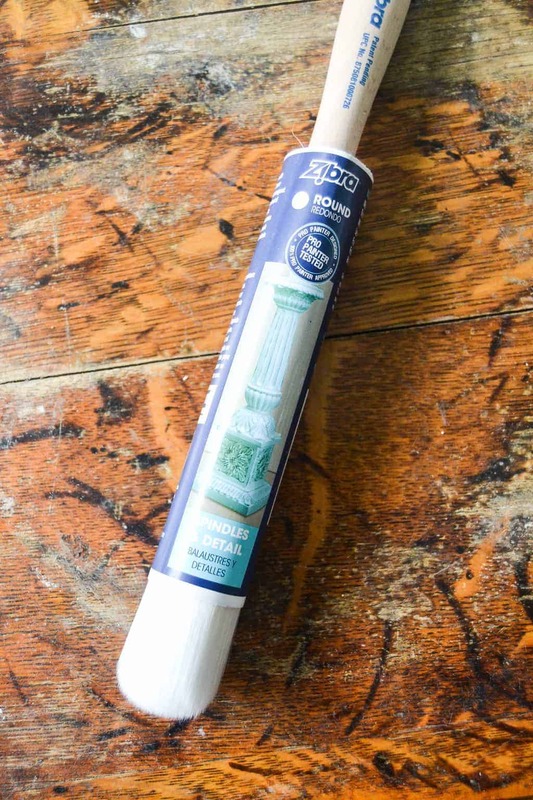 The 2″ AS Cut-In brush would be good to paint some decorative molding and trim in our kitchen. Love your blog!! Look forward to learning something new…. Thank you. Your end table is wonderful, love the green! Not familiar with these brushes, but am all for anything that makes painting easier! Congrats on your flip house! Beautiful job! I would love to try all the brushes! I have several pieces of furniture sitting here that I need to begin wor on. These brushes should spur me on! I love this green! We repainted our home last summer with all grey (greige) walls and white woodwork and I’m adding little pops of color in each room. 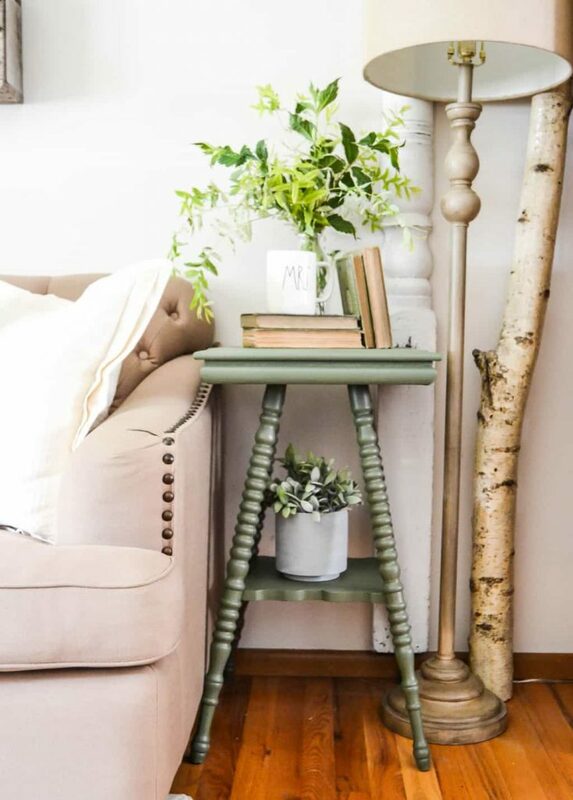 I have a very old small plant table at the the top of our stairs that would look beautiful in this green! Thanks for sharing! Your welcome! The color is perfection! And it has these same “curvy” legs so will have to check out these paint brushes! I have a table very similar to this and love it. It is currently painted red and does not match anything in my home. I totally love the bayberry and look forward to updating it! Thanks for inspiring me with this post! Such a beautiful vignette! I love everything about it, but I can’t resist the table! The triangle brush! It’s so hard to get tight corners without globbing it on with just a rounded brush! I bought 1 of these brushes – the triangle one and I can’t say enough about it!! Love this brush and I would so LOVE, LOVE, LOVE the others. Keep re-creating kiddo!! Love these brushes! I never know what type to use on my makeovers so these would be great. I love the table you redid. 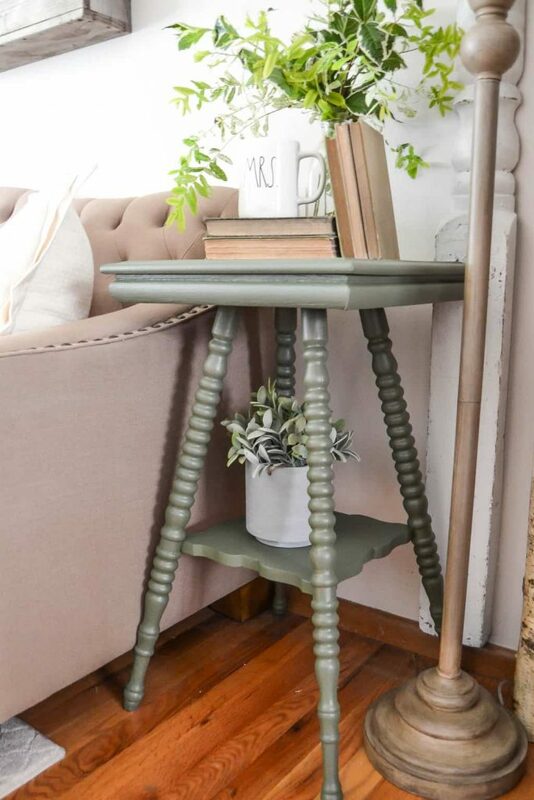 The paint color is a beautiful green and the small table is very unique!! Sorry, but I also wanted to congratulate you on the sale of the flip house. Ya’ll have done such a great improvement on this cute house. I know the new owners will love living there. Can’t wait to see your next one!! I really like the Chiseled Wedge Painter’s Brush. It would be perfect for doing the trim work in our master bath. I think the triangle brush since I am getting ready to paint my living room. Hate to do the trim, especially corners! Think you should keep the green table….looks nice there. 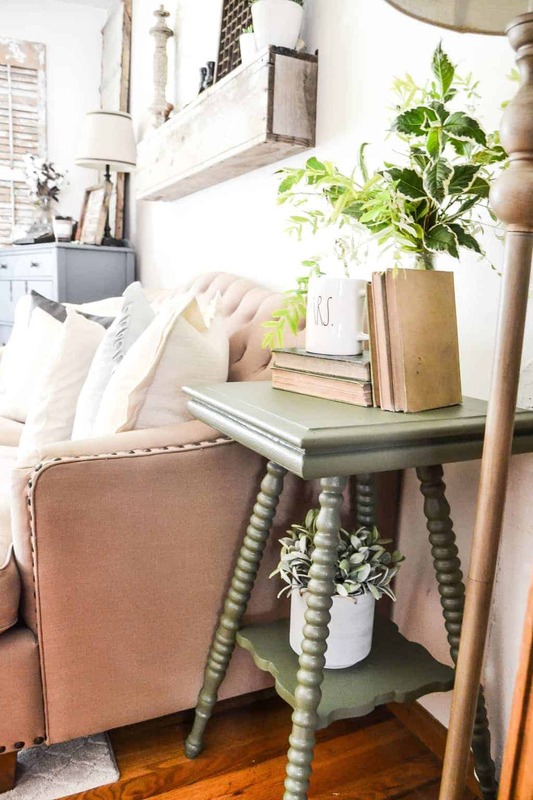 Love, love, love the side table project! Absolutely perfect next to your couch! I vote to leave it! I’d also love to try those brushes, so fingers crossed! Chiseled Wedge Painter’s Brush looks great but so do all the detail brushes. As an avid DIYer these would be awesome. I can’t wait to try the curvy brush- I have two tables just WAITING to be (re)painted! I have the exact same table! It is such a fun piece! Thanks for the tips on painting curvy legs, I have always resorted to spray paint.